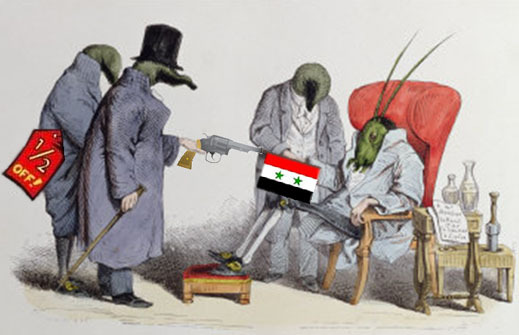 The Russian grain trade is complaining that there has been another outbreak of the weevil wars delaying large consignments of Russian export wheat from being landed and sold at ports in Syria and Egypt, ostensibly for reason of infestation. This time, two vessels and 110,000 tonnes of grain, originally loaded at Novorossiysk, are reported to be standing at the Syrian port of Tartus. The Russian Grain Union president, Arkady Zlochevsky, revealed the shipping problem at a meeting in Moscow yesterday of the Federal Antimonopoly Service (FAS). Zlochevsky blamed the Syrian consignees for refusing to accept unloading on account of pest infestation and problems with the cargoes’ Russian phytosanitary certificates. A bureaucratic snarl has compounded the problem, because the Russian agricultural inspection agency Rosselhoznadzor (RSN) won’t send inspectors to Syria at its expense; nor accept payment of the fares for the inspectors by the grain exporter or shipping company. Also, according to Zlochevsky, the seller and shipper have found alternative buyers in Egypt; but before the vessels can up-anchor and sail south, RSN must agree to a variation in the original certificates, substituting Egypt for Syria as the destination. But RSN regulations require a fresh inspection before that is allowable. It is too expensive for the cargo owners to return the vessels to Novorossisyk, so the ships and grain have been sitting idle at the Syrian port for three months now, while, according to Zlochevsky, Russian administrators in Moscow have failed to agree on what can be done. The trader and Russian Grain Union sources acknowledge that the Egyptians are also playing the same game, months after the weevil first made its debut as an international weapon wielded against Moscow. In May, government officials at the Egyptian ports of Safaga and Damietta seized and quarantined an estimated 137,000 tonnes of grain from Novorossiysk. The seizures were reported in the Egyptian and Russian media to have been ordered by the Egyptian prosecutor, allegedly on claims of high weevil infestation. Russian traders told Agriprods.com at the time that they blamed the Egyptian authorities for attempting to delay the unloading of the Russian grain, in order to force Russian sellers to lower their price. Other Russian grain industry sources said there was also a plot at the Russian end as well. They said they suspected the Kremlin of trying to cut the commercial grain traders out of the business entirely, and sell to Egypt only wheat and corn from the United Grain Company (UGC — Russian acronym OZK). This 100% state-owned company was created by a presidential decree on March 20 of this year. The weevils would not prove to be a problem for the Egyptians, these sources claimed, so long as the consignor were OZK. The latest information available from the Grain Union is that in September, a new cargo of 63,000 tonnes of Russian wheat was arrested at Port Said. The local officials claimed the cargo certificates were not in order. The Grain Union cannot say who the consignor of the cargo is. The trade source added that in Egypt the earlier cargo holdups were influenced by lobbying from rival US grain interests. “However, lately the influence has weakened”.